Komondor is an old breed from Hungary. Although written records are nonexistent, legends detail the breed’s long use as a livestock protection dog. Today, the Komondor still protects flocks of sheep in the hills of Hungary but has also found a home protecting sheep in the western U.S. The Komondor is large, standing no less than 25.5 inches tall for Komondor females and no less than 27.5 inches for Komondor males. Females weigh 75 to 85 pounds, and males usually weigh about 100 pounds. The dog has substantial bone and is muscular. The coat is white and, in mature dogs, corded. (The cords are tangles of fur that form hanging mats.) 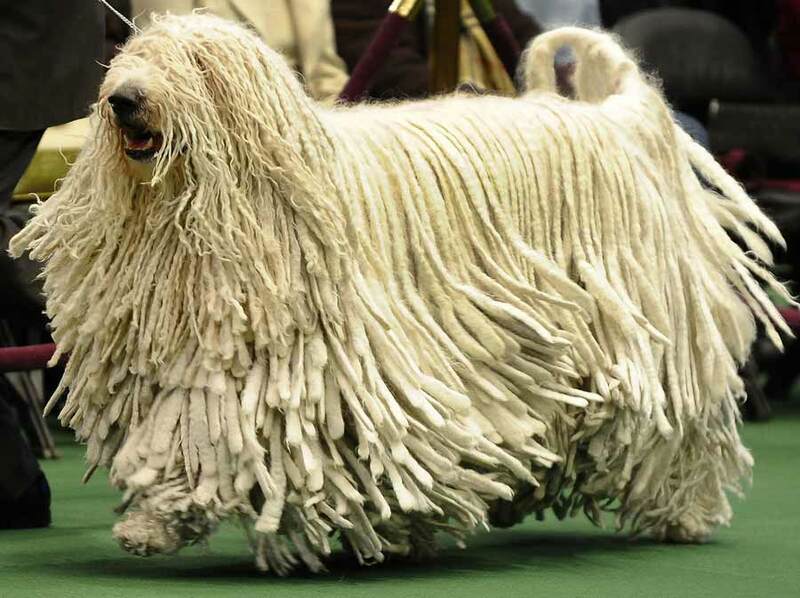 Anyone who is thinking of sharing a home with a Komondor should discuss the coat’s unique grooming needs with a breeder, as the cords require very specific care. If the Komondor dog gets wet, it can take two days for him to dry! The cords can also trap dirt. Komondor puppies can be active and playful, but adults are calmer. A couple of brisk walks and a play session each day will keep this dog happy. 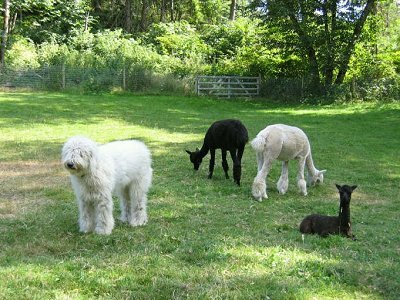 As a livestock protection dog, the Komondor is used to thinking for himself. He can be independent. However, with upbeat, fun, and structured training techniques, the Komondor is trainable and can learn to enjoy training. Many compete successfully in dog sports, including agility. Early socialization is vital, as this breed is wary of strangers and can be very protective. The Komondor dog breed may be too much for a first-time dog owner. He will do best in a home with a knowledgeable owner who is not too meek and who understands his coat care needs. The Komondor is gentle and watchful of his family’s children but may mistake rough play for something more sinister. The Komondor breed is protective and will bark at perceived threats; this can cause problems with neighbors. He is good with other dogs in the family but may be aggressive toward strange dogs. Health concerns include bloat, torsion, and hip dysplasia. Note: Upload only Komondor picture or your picture with Komondor below - spammer's ip may be blocked. The Komondor is patient with his own family’s children, but can be overprotective when neighborhood kids join in. Similarly, he may be protective of his own family’s pets while aggressively attacking others. Frankly, most Komondors are “too much dog” for the average household. This is a serious working dog with tremendous strength, and very few people can really provide the home or lifestyle that keeps this breed satisfied. Karma is a livestock guard dog, guarding alpacas at IslandLife Farms on Vancouver Island, BC. She’s grown to be quite a big girl…still has her puppy moments, but she keeps everything safe. Her owners are now comfortable having her share a field with their crias (baby alpacas), even ones at 2 weeks of age.